Do students with Down syndrome learn mathematics? only 6% were able to use money and to manage independently in a shop. In 1988 Janet Carr presented data taken from a longitudinal study of 41 young adults with Down syndrome: at an average age of 21, the maths skills compared to those of a typical 5 year old child, but the reading skills compared to those of an 8 year old. In 1988 Gelman and Cohen found that children with Down syndrome learn the 5 principles late, but they could be trained by exercises (see Macquarie programme of Thorley and Woods, 1979, and research by Joanna Nye and Gillian Bird, University of Portsmouth, 1995). In 1991 Caycho, Gunn and Siegal found counting skill had a correlation with the development of receptive language and then it could depend on the educative program and on the adult-child interactions. In 1994 Billie Shepperdson studied the reading and number abilities of two groups of English people with Down syndrome, the people of the first group were born in the sixties and the other were born in the seventies: as teenagers the seventies group had better performances in mathematics than the sixties group at the same age, maybe due to the better learning opportunities and, if teaching continues, they keep on improving into the adult years. In more detail, in 1995, Nye, Clibbens and Bird found a correlation between numerical ability and receptive grammar. Some researchers found a significant correlation between mental age and numerical ability, others (as Baroody, 1986 ) did not. For the above reasons, special education teachers considered teaching academic skills in mathematics not useful but frustrating, and preferred to focus on community living skills such as the practical use of money and the ability to tell time. [12, 13] This was a notable idea, which helped many disabled people to reach autonomy! My questions are: Are we sure they cannot learn more? Are we sure about what is basic in mathematics and what is the best path to follow in order to teach to each student? In Italy, the inclusion of students with disabilities in mainstream classrooms has been warranted by law in elementary and middle schools since 1977 and in secondary schools and universities since 1992. Students with Down syndrome may go on to secondary school, but, until now, no one has been able to get a secondary school diploma: they usually get a certificate of their achievements. So far no one with Down syndrome has attended University. In any case, in an inclusive environment, the teachers and children are motivated to try more academic skills, following the achievements of the typically developing students. Inclusion in mainstream schools gives the child the opportunity to study different topics and try various activities. [15, 16, 17, 18, 19] The desire to work in the same way as their peers, gives them the will to do their best! collaboration between the teachers of the class and the support teacher of the child with special needs, so that the child is a pupil of all the class teachers and not only of his support teacher. Even in severe cases, when a support teacher is present all the school time, students with special needs are very sensitive to the class teacher's attitude towards them: the class teacher has the authority of the 'true' teacher and, on the contrary, the support teacher is considered a 'friend'. When these two conditions take place together, the child becomes a 'genius' in mathematics, as nobody would have believed before! Despite good intentions, successful inclusion is not easy. In 1985 Anna Contardi studied how the inclusion of all the students with Down syndrome in the middle schools of Rome works. In the logical-mathematical achievements the students with Down syndrome retained what they had learned in elementary school, but did not improve. Sometimes they did worse. The author wondered whether these results were due to the characteristics of students with Down syndrome or to the manner of inclusion. We believe we have to adapt inclusion to the character of the students, and the teacher's expectations of the student's abilities play a basic role in improving learning. Hence better formation of the teachers is needed. On the other hand, Contardi tested the logical-mathematical achievements mostly with indicators of arithmetical skills, where students with Down syndrome have more difficulties. School: 12 in elementary school, 6 in middle school, 2 in secondary school. 'Good social integration in the school' means the student remains in his or her classroom most of the time, is happy to stay there (often does not want to leave), is welcomed and loved by his or her peers and participates in the social activities of the class. 'Follows most of the class programme' means the student follows the class programme, adapted at a lower level, with simplifications and changes and takes class tests (with simplified tests). In some topics the programme can be shifted backwards usually one or two years to fill some gaps. Even with these limits, they improve their mathematical academic skills, as nobody would have believed before. 'Follows partially the class programme' means the student follows the class programme less than the above group, this is often the choice of the teachers or for temporary problems and not due to the student's difficulties. 'Follows little of the class programme' means the student has particular difficulties and needs special education programmes, different from the class programme. In spite of these limits, he or she shares many activities with the class (social, musical, sports, and recreation). Other problems in addition to Down syndrome: 6 students (2 with hyperactivity, 1 with depression, 2 with relational problems, 1 autistic). The adapted mathematical programme is usually followed conforming to the global programme, but differs for two students who are weaker in mathematics that the others and two students who are stronger in mathematics. Since 1994 I have been counselling teachers in schools to adapt the mathematical program for students with Down syndrome. Usually the parents contact me at the Associazione Down Padova, to which I belong (also as a parent) and ask me to meet the teachers. Often my intervention is not limited to mathematics, but involves the entire curriculum and other aspects of inclusion. This activity has allowed me to follow up 20 cases of students with Down syndrome, included in regular classrooms, as summarized in the box. This evaluation was done taking interviews with teachers and parents, school records and homework into consideration. Hence we have students with Down syndrome who learn to solve problems, to use fractions, to solve algebraic expressions (see Figure 1), to measure, to solve geometric problems, to draw geometric figures and diagrams, to use the computer. They are given slightly different tests when tested with their peers and if there are difficulties in mental calculation we suggest visual prompts, such as some simple memory device to carry, or a pocket calculator. In difficult cases, the desire to use money or the ability to tell time gives them the motivation to begin to study mathematics and enjoy it. Since 1996 I have organized and managed continuing education courses at the Associazione Down Padova for adults with learning difficulties. In a course for illiterate adults, a 51-year old man with Down syndrome is learning to read, write, count and tell the time (see Figure 2). He is so enthusiastic to learn and that gives us a joyful feeling! Other adults maintain and improve their mathematical knowledge. Adults who have attended mainstream schools have much more mathematical ability than those who have not. 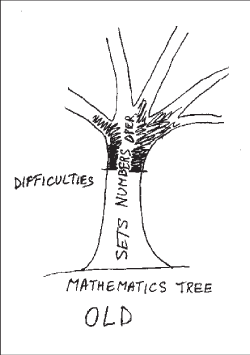 What difficulties (and strengths) do we observe in mathematics? Difficulty in reciting fluently the sequence of numbers beyond 20 for errors in the change of the tens. The use of rulers can help. Difficulties in understanding the decimal system and the positional value of the digits. There are no difficulties in learning the procedure of counting objects. Difficulties and slowness in remembering multiplication tables and in doing mental calculations. When the aim is not the operation, we suggest the use of a pocket calculator. There are no difficulties in working on sets, which means the classification of objects according to one or two or more characteristics, and in logic, i.e. negation, relations, tables of true and false, short chronological sequences, cause-effect relations. In problem solving, there are no difficulties if we first teach the students to visualize the problem, by making a sketch or by objects, and write the arithmetical solution afterwards. Difficulties in measuring lengths because they do not properly fix the zero point of the ruler. The students learn the procedures slowly, but when they have learned them, they perform the procedures carefully and in the right order. In the beginning, a visual representation of the procedure helps. There are no limits of age to learn mathematics: students need the opportunity and an aim, for instance autonomy. These difficulties were observed in many students, though not in everyone, and sometimes they overcame them. For instance there are students who do mental calculations. What are the possible reasons for these difficulties? Sometimes the difficulties in arithmetic, the slowness in learning and the difficulty in retrieving what they have learned, discourages teachers from continuing in the study of mathematics, and they prefer to go back and repeat what the child is not able to do. I do not agree with this attitude, because they need to do exercises, but they also need to have a positive image of themselves: hence it is better to follow their interest and go on with the program, helping them in what they are not able to do or allowing them to use some device to fill the gaps. What is basic in mathematics? Usually people believe that arithmetical skills are the basis of the entire mathematical knowledge, because they are the first step in learning mathematics and because all people know them. This is illustrated in the 'old' maths tree in Figure 3. Arithmetic is important, but there is much more that can be learned satisfactorily, and supports such as calculators, visual and other aids can be used to fill the gaps for the arithmetical difficulties. 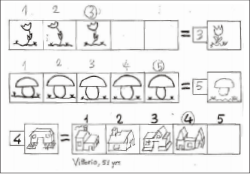 Persons with Down syndrome have notable logical abilities, abilities in space organization, in performing procedures, in understanding and using symbols: these are basic abilities, more important in daily life than arithmetical skills, and taking these as a basis, mathematical knowledge will be built up. 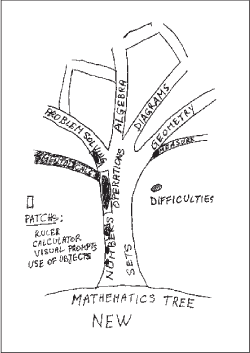 This suggests a different conception of maths, illustrated in the 'new' maths tree in Figure 3. Here arithmetic is seen as one branch of maths but not a prerequisite for learning other aspects of mathematics. I have reached this conviction by observing persons with Down syndrome and by listening to their teachers and parents, and I am doing research in this area. How can we stimulate mathematical learning? The more important motivation to study mathematics is to learn what everybody else is learning, which means to be included in the mainstream school. Other stimulation can be given by social or individual games and by aims of autonomy, also for children in school (for instance, to learn the schedule of the day and of the week, calendars, telling time, use of money.) It is important also to give an active role to the child and believe in his/her abilities. Most of the students have a successful inclusion in school and follow the class program in mathematics, adapted at a lower level, with simplifications and changes and take class tests (with differentiated tests). Usually they are not weaker in mathematics than the other subjects: it may happen, but the converse may also occur. We have to change our attitude about what is basic in mathematics and give more value to logical and mathematical abilities which do not involve computations. There are children who are good in mathematics and who like mathematics. 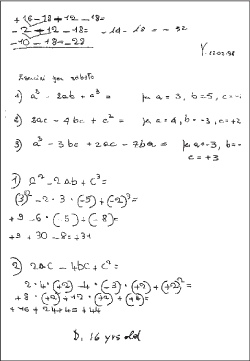 Courses of mathematics for adults are also useful, because they can learn what they have not learned before. There are no limits of age in learning mathematics. Many thanks to the persons with Down syndrome, to the parents, to the teachers of the schools, to Anna La Rosa and Francesca Cella, teachers in the continuing education courses of the Associazione Down Padova. Cornwell, A. C. (1974) Development of language, abstraction, and numerical concept formation in Down's syndrome children. American Journal of Mental Deficiency, 79 (2), 179-190. Gelman, R. & Gallistel, C. R. (1978) The Child's Understanding of Number. Cambridge, MA: Harvard University Press. Buckley, S. & Sacks, B. (1987) The Adolescent with Down's Syndrome. Portsmouth: Portsmouth Polytechnic. Carr, J. (1988) Six weeks to twenty-one years old: A longitudinal study of children with Down's syndrome and their families. Journal of Child Psychology and Psychiatry 29 (4), 407-431. 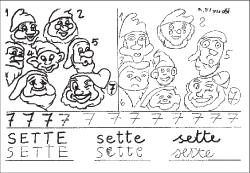 Gelman, R. & Cohen, M. (1988) Qualitative differences in the way Down syndrome and normal children solve a novel counting problem. In L. Nadel (Ed. ), The Psychobiology of Down's Syndrome. Cambridge, MA: MIT Press. Thorley, B. S. & Woods, V. M. (1979) Early number experiences for pre-school Down's syndrome children. Australian Journal of Early Childhood, 4, 15-20. Nye, J. & Bird, G. (1996) Developing Number and Maths Skills. Portsmouth Down's Syndrome Trust Newsletter, 6(2), 1-7. Caycho, L., Gunn, P. & Siegal, M. (1991) Counting by children with Down's syndrome. American Journal on Mental Retardation, 95 (5), 575-583. Baroody, A. J. (1986) Counting ability of moderately and mildly handicapped children. Education and Training of the Mentally Retarded, 21, 289-300. Cuvo, A. (1978) Validating task analysis of community living skills. Vocational Evaluation and Work Adjustment Bulletin, 11, 13-21. Ianes, D. & Celi, F. (1995) Nuova guida al Piano educativo individualizzato. Edizioni Centro Studi Erickson, Trento. Biklen, D. (1985) Achieving the Complete School: Effective Strategies for Mainstreaming. Teachers College Press, New York. Brown, L. (1995) Inclusion in Education and Community Life. In Nadel, L. & Rosental, D. (eds. ), Down Syndrome: Living and Learning in the Community, Wiley-Liss, New York. Snell, M. E. (1990). Schools are for all kids: The importance of integration for students with severe disabilities and their peers. In J. W. Lloyd, N. N. Singh & A. C. Repp (Eds), The regular education initiative: Alternative perspectives on concepts, issues and models (pp.133-149) Sycamore, Sycamore, IL, USA. Udvari-Solner, A. (1995) Curricular Adaptations: Reconfiguring Teaching Practice to Support Students with Disabilities in General Education Classrooms. In Nadel, L. & Rosental, D. (eds. 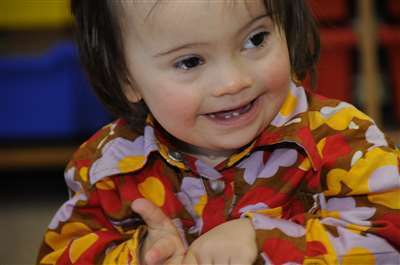 ), Down Syndrome: Living and Learning in the Community, Wiley-Liss, New York. Contardi, A. (1987) L'inserimento dei ragazzi Down nella scuola media del Comune di Roma nell'anno scolastico 1983-84. In R. Ferri (ed) Il bambino Down a scuola. Seminario di studi, Roma, ottobre 1985, Juvenilia s.p.a. Editrice, Bergamo. Cella, F. & Monari Martinez E. (In preparation) Un 50-enne con sindrome di Down impara i numeri. Monari Martinez E. (1995) Giochi di prematematica per bambini Down: un seminario per genitori e insegnanti. 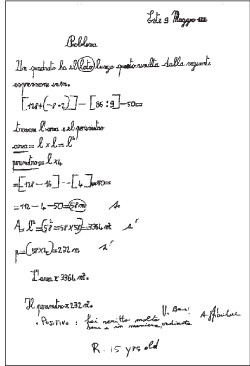 In C. Caredda, P. Longo & B. Piochi, Matematica e difficoltà n.5 : Il ruolo della Matematica nella conquista dell'autonomia, Ed. Pitagora, Bologna. Monari Martinez E. (1996) Strutturare e misurare il tempo: un seminario per genitori e insegnanti di bambini Down, Preprint of the Department of Mathematics Pure and Applied, University of Padua.